HaVL’s shrimpcake noodles in pork broth. A drizzly, cool Monday morning. After traveling for the past three weeks, Jeff was home, briefly, before heading on the road again. And I, having been laid off about 8 weeks ago, was starting to feel itchy and unsettled. Anxiety and self-doubt were creeping in, especially with my recent solitude. Jeff took the day off — a day of rest and laundry before leaving again the next morning. I suggested checking a to-do off my unemployment bucket list: Have a late breakfast/early lunch at HaVL on SE 82nd. Crabflake noodles with straw mushrooms and quail eggs. We arrived around 11am and the small space still had a few tables available. I expect it was an anomaly given that all the tables were full only shortly after we arrived. 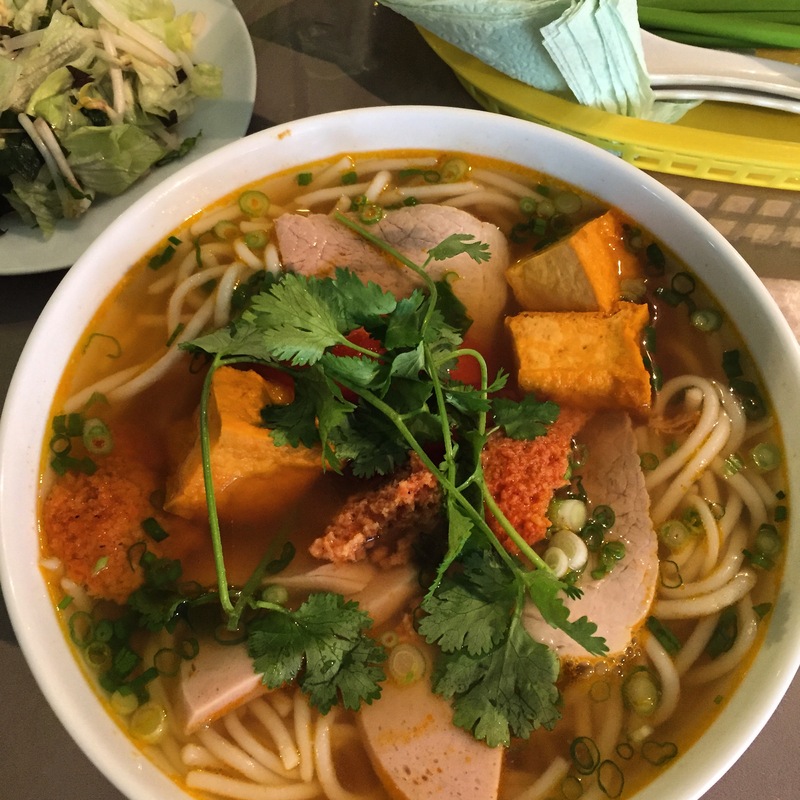 The vibrant green walls brightened the small space, even on a dark day, and the staff quietly hustled around taking orders and delivering wrapped bánh mì sandwiches, steaming bowls and smaller plates of add-ons: sprouts, mint, cilantro, lime. On Monday, the soups were crabflake and shrimpcake. We got one of each, naturally. 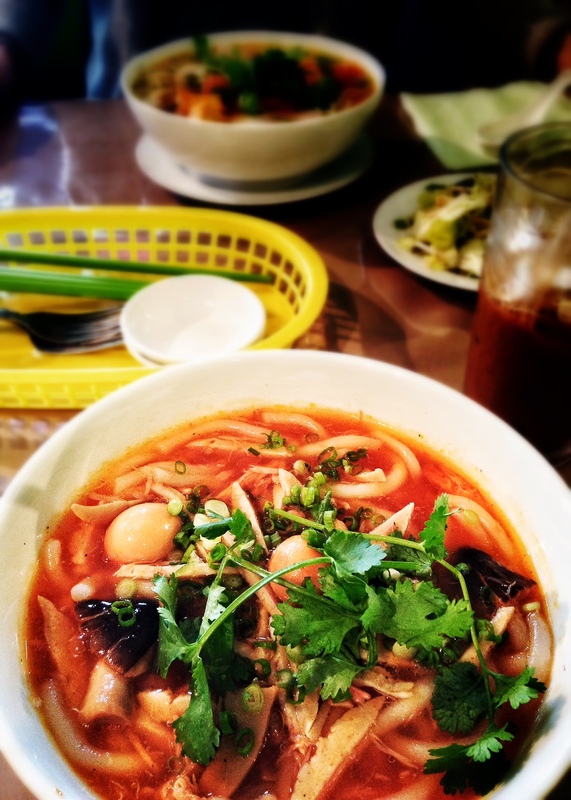 Shrimpcake soup had a lighter, but deeply flavored, pork broth and skinnier rice noodles. The crabflake soup had a velvety, thickened pork broth and fat, slippery rice noodles. What a great way to spend a “Drizzily Day!” Would love to try all of those soups! Ha, I agree! I’d like to try the all as well. You’d better make a trip over sometime and we’ll go! mmmm crabflake noodle soup sounds wonderful on a wet day. Chin up and keep positive—make some bread when you feel the creeping self doubt. love you. Thanks, sis. Love you, too.